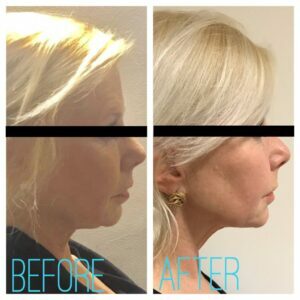 A thread facelift is basically a non surgical technique using threads to reduce sagging around the cheeks, jawline and neck with less risk than invasive surgical solutions. It can be carried out in an hour or so (which is why it has been called the lunchtime facelift)! Results last several years and can be seen immediately. It works by inserting and orientating a thread or threads to oppose the natural force of gravity which causes line creation and skin weakness. Depending on the area, either a single thread or multiple threads can be used. Ultimately the aim is twofold: 1) to create lift and volume and 2) to increase collagen and stimulation thereby improving tone and elasticity. Our clients love it. I’ve actually had a threadlift myself! I was a little sceptical at first but completely won over after treatment! My jowls are tighter and I look better in photos now than I did 5 years ago!! The techniques and thread products are becoming more sophisticated for better results and longer lasting performance. 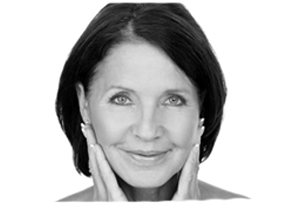 Happy Lift is a new product being used by Changes which is showing the best results seen in the 4 years Dr Vincent has been practising! I’m looking forward to my Happy Lift neck treatment in a couple of weeks! Watch out for my photos!